The CasITa-to-5k did some stair work at the local LA Metro station yesterday before our run. Over 300 artists have been commissioned for Metro projects since the Metro Art Department was established in 1989. 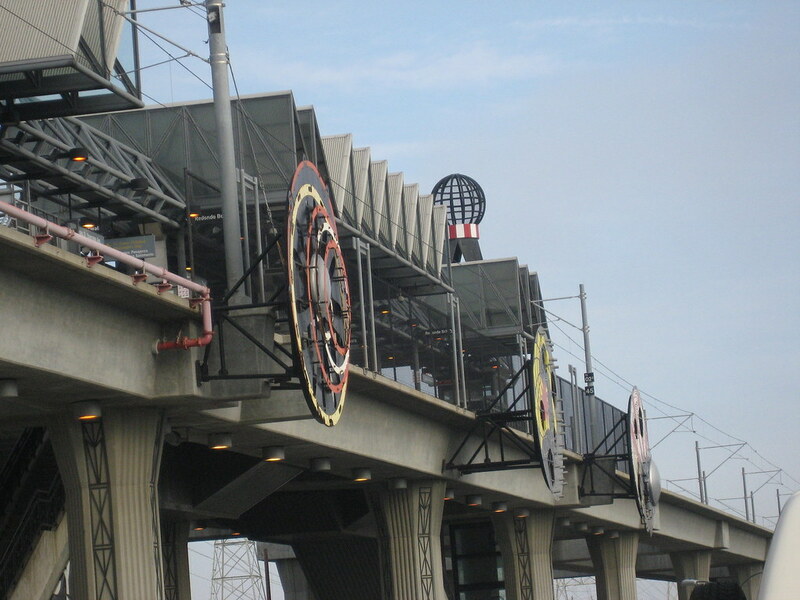 A couple of years ago, I attended one of the LA Metro Art Tours. The two hour tours are led by volunteer docents and offered the first Thursday, Saturday and Sunday of every month. Included with the tour is a free rail day pass. From the LA Metro Art Tour website, Metro’s Docent Council is a group of volunteers committed to increasing awareness of the broad range of art in the Metro Rail system through public tours that provide insights into the artworks, the artists who created them, the processes it took to make them, and the communities they enhance. While docent programs are commonly found at museums around the world, Metro is the first transit agency to benefit from such a program. I found the Metro Art Tour fascinating. I had no idea so much history was embedded in each station. At the Hollywood/Vine Station, actual movie reels line the walls. 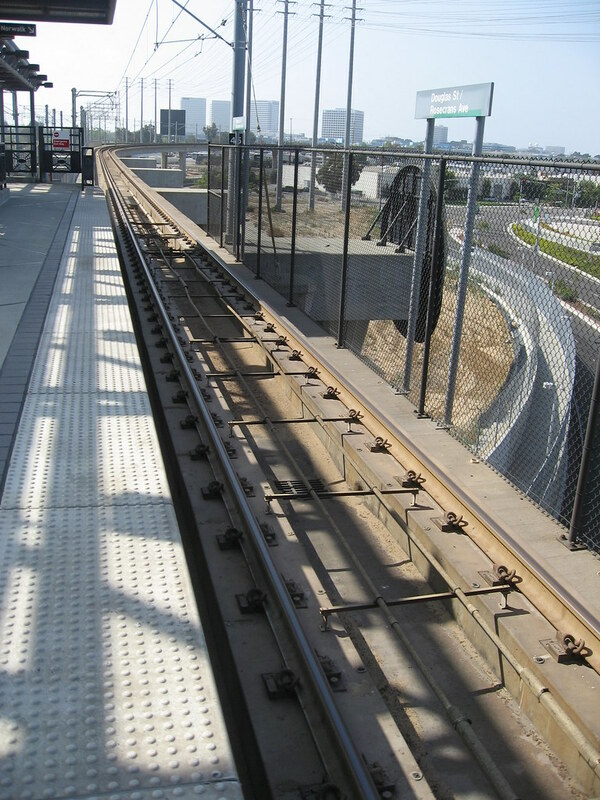 The Douglas/Rosecrans Station was designed by Renée Petropoulos from Escudero-Fribourg Architects. Petropoulos said, People who use this station are daily commuters who work in this area. I wanted the various aspects of this station to reveal themselves over time, for the station to be experienced as a giant art piece in which the understanding of the whole is reached through daily encounters with each of its elements. I chose to focus on the idea of location—places that identify you in terms of where you are in the city, in the country, in the world—including psychological location. I wanted to pose some questions about monuments or markers as identifiers, including seeing the station as a possible landmark. We went up and down the sets of stairs. 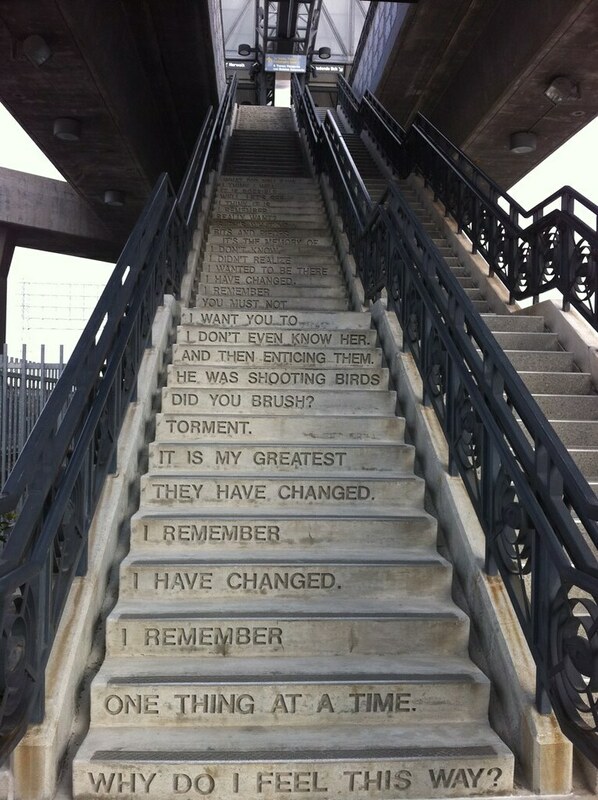 Reading the quotes on the steps helped take our minds off the burning sensation in our legs. When we felt like we couldn't climb another step, we headed to the parking lot to start our intervals. We skipped the brisk walk warm-up since we did the stairs and repeated the Week One schedule with 60 seconds of running and 90 seconds of walking. Oh those stairs are incredible!!! I've selected you for an award! You can pick it up on my page. very cool! i love the words going up the steps. 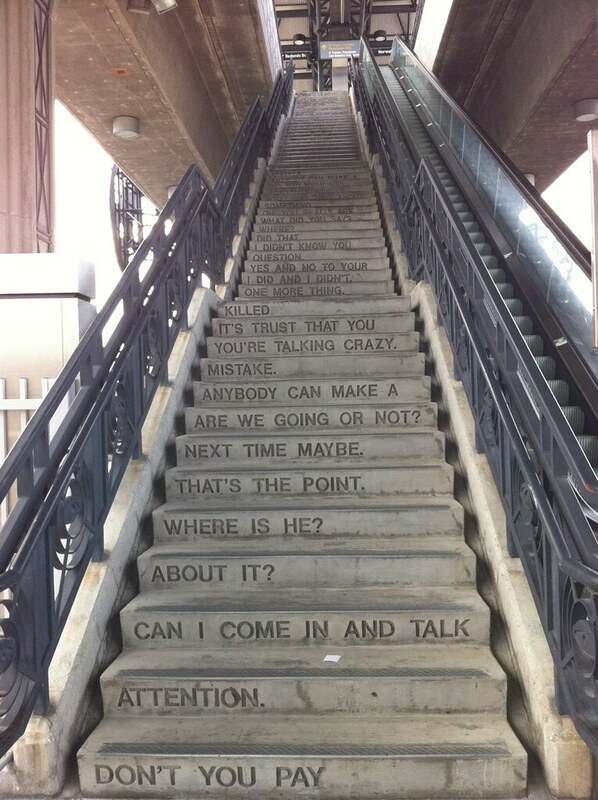 I love the writing on the stairs! Very nice. WOW, stair workouts are my least favorite form of torture!! Way to go! Those stairs are awesome! I did some stair training for my upcoming mountain race. I hope it helps! I hate stairs, I usually fall down them.